Do you eat dessert after dinner when you’re at home? Even though I love sweets, I rarely eat dessert unless I’m at a restaurant and Evan would rather have second helpings of salad over dessert any day, so it really makes no sense to craft up anything too elaborate. But, every so often, I’ll make us a special dessert to enjoy at home. The only problem is that we’ll often have leftovers. And while too much dessert is hardly a problem, I’m usually the one who polishes off the leftover pie, or cake, or cookies! A slippery slope, my friends. So, I’ve been looking for ways of turning my favorite decadent recipes into two portion servings – the perfect amount of sweet for me and my sweet. 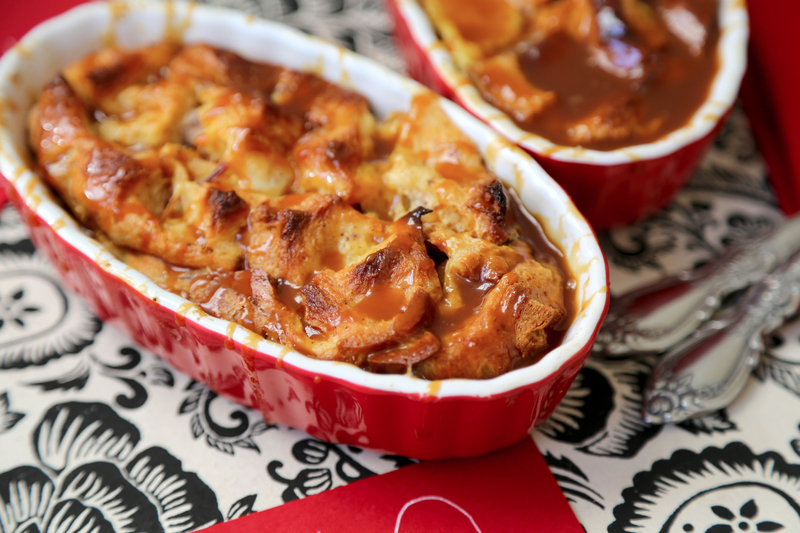 Bread pudding is a dessert that always seems to impress guests. It’s not all that common but so delicious that it seems way more exotic than it really is; and it can be dressed up in infinite ways. Plus it’s so simple, you’ll almost always have the makings for it: bread, eggs, dairy and sugar. 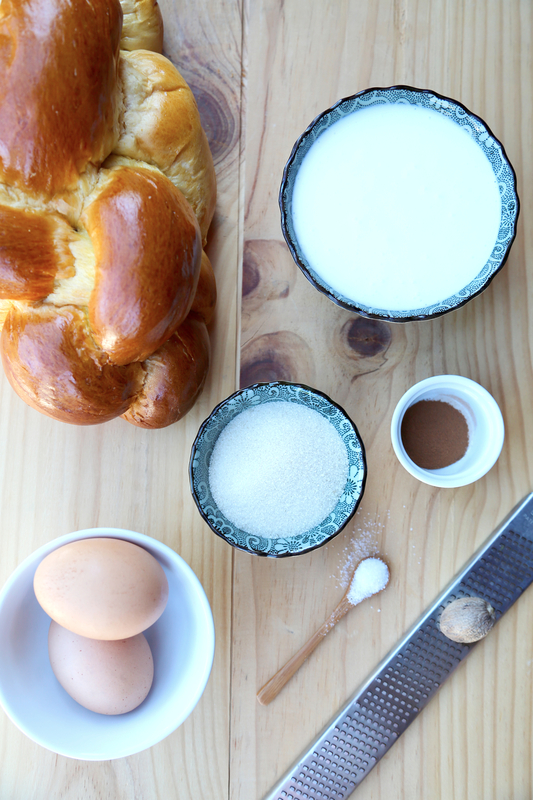 Challa is my favorite bread for making bread pudding; it’s big, fluffy, and a bit sweet already so it lends itself very well (sidenote: have you had toasted challa with Nutella and strawberries?!!! A-mazing!). 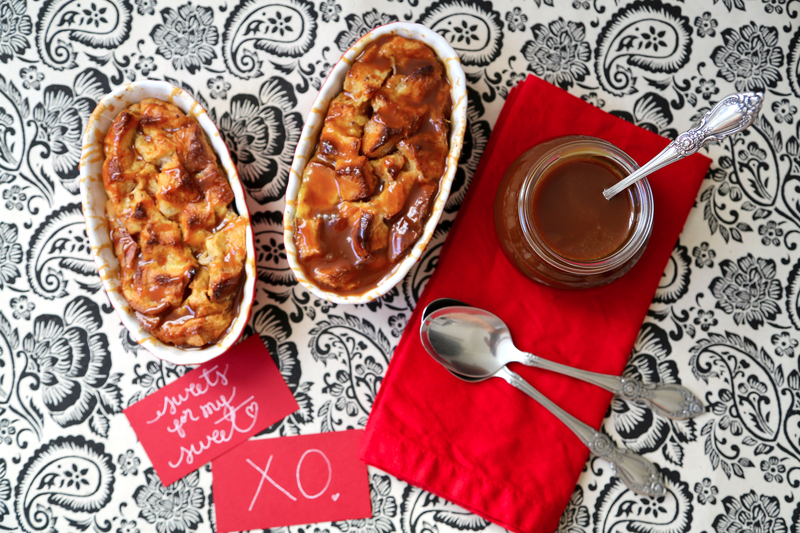 I wanted to make this recipe extra special and decadent – something you’d want to share with someone you love (or just like really hard) – so I added salted caramel, cinnamon and nutmeg to the equation to sweeten the deal, so to speak! With Valentine’s Day just around the bend, this would make a super easy and delicious end to a romantic dinner. Bonus: you can prep it ahead of time (today!) and pop it in the oven just before your ready to enjoy it (tomorrow!) and you’ll have a cozy serving of lip smacking bread pudding covered in sweet and salty goodness. Enjoy! Grease two 8oz. ramekins or baking dishes. Divide bread between the two and set aside. In a bowl, whisk eggs, milk, sugar, cinnamon, nutmeg and salt. Pour over bread slowly, making sure to overflow. You may want to push down a little on the bread to help it absorb the liquid as your pour. Bake, uncovered for 40 minutes or until a knife inserted near the center comes out clean. Cool slightly. Drizzle with warmed salted caramel sauce and serve immediately. Note: Vanilla ice cream plays well with warm bread pudding. BON APPETITE! ← Make this: Valentine Song Prints! I have only had bread pudding once, with caramel, and it was so delicious. This looks super amazing! To hell with valentine’s, I want this every day of my life! Well done. Have you baked in some chunks of dark chocolate? Or perhaps some nutella?? That would be even more amazing… but then again I would put chocolate on anything…. I think I’m going to try this with hawaiian bread! Omg, I’m drooling looking at ur photos! Reblogged this on bunciss87's Blog. Maybe this is just me being ignorant – but 1/8 cream of tartar – is there any kind of measuring to go with it 1/8 tsp? tablespoon? cup? YIKES! Thank you for pointing that out! Yes, it’s 1/8 teaspoon (just a pinch). I’ve updated the recipe. Thanks Lucy! Are you making this? I hope you enjoy! OH MY! 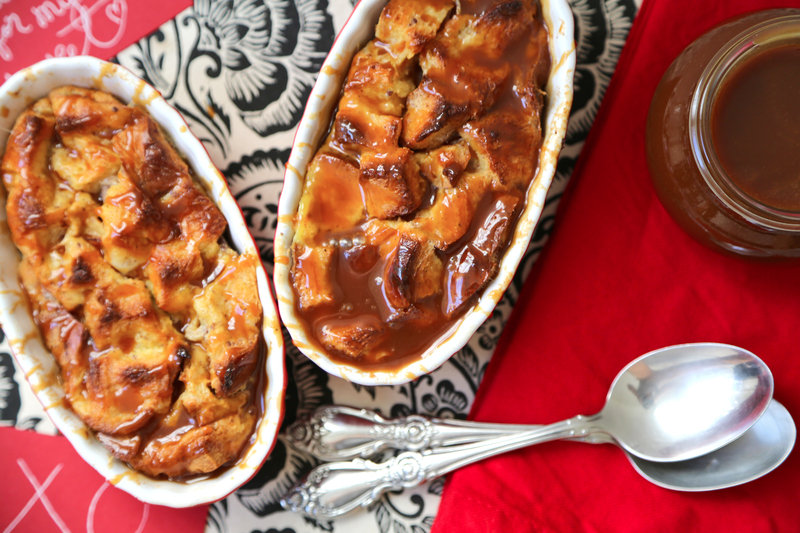 One of my absolute favorite desserts is bread pudding, and this one looks phenomenal. I am in love with your blog and this recipe is what pushed me over! Oh my, I want to eat everyone of those photos.